The Bearded Ladies Cabaret opens Wednesday, Sept. 27 at 7 p.m. and runs through Oct. 22 at the Arden Theatre. When “Cabaret,” opens at the Arden Theatre tonight, the gloriously immoral tale of love, life and political disarray in Weimar, Germany may have met its match in John Jarboe. The decadent Kander and Ebb musical classic is right on time, touching as it does on the rise of Nazism, rampant Nationalistic politics and gender-bending sexuality. When there are questions of androgyny and social politics to be had in theater, Jarboe must be in the mix. “I think the big question facing artists always – but especially in a heated political time like this – is how we make work that is politically engaged and radical,” Jarboe said during a break from rehearsal at Old City’s Arden Theatre. “Now, I think the next step is having my main scene partner – the audience – to play with,” said John Jarboe. The Bearded Ladies Cabaret is Jarboe’s seven-person theater team. It insists “art can be intellectual and accessible, entertaining and meaningful, stupid good and just plain stupid,” he said. “Our shows tackle the politics of gender, identity, and artistic invention with sparkle and wit.” The “Beards” have been involved in everything from the Parisian events of the Philadelphia International Festival for the Arts (PIFA), to “Andy: A Popera,” from FringeArts and Opera Philadelphia. This November, The Beards are taking their act on the road, touring Miami with their Dietrich-ian show “Marlene and The Machine.” Jarboe also states that The Beards are working with FringeArts to continue their exploration of “The Poison Cookie Project,” which bring international cabaret artists together in the Fall of 2018 to Philly to perform the history of the form. During the fall/winter season, The Beards will stage events around Philly to lead up to this “Poison” project. Stay tuned. The show should not be safe, or polite. It's not worth doing otherwise. It should place the audience boldly between the extremes of freedom and fascism." 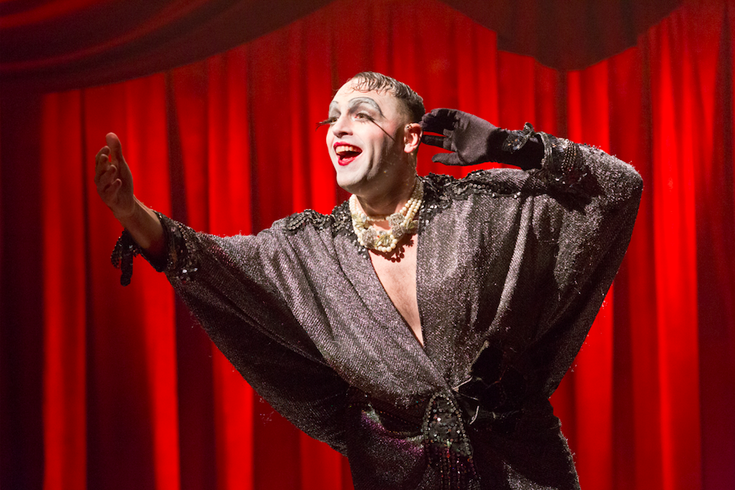 For now though, there is “Cabaret” at the Arden, and the seemingly giddy, definitely gaudy, but haunted role of “The Emcee.” As viewed by Jarboe, the sleazy character is an enigma – “a sort of living metaphor for the city of Berlin itself,” he said. During the rehearsal process, Jarboe said that he allowed the character’s political awakening to blossom beyond the decadence, slowly. “Now, I think the next step is having my main scene partner – the audience – to play with,” he said. Ask Jarboe about how he and “Cabaret” director Matthew Decker interpret the seedy script’s political overtones and how they play into the Trump Era, and the actor leaps at the opportunity. “Obviously, the play is super relevant,” he said. Cabaret opens Wednesday, Sept. 27 at 7 p.m., and runs through Oct. 22 at the Arden Theatre Company, 40 N. 2nd St. Tickets are $15-$37. For more information, call 215-922-8900 or click here.